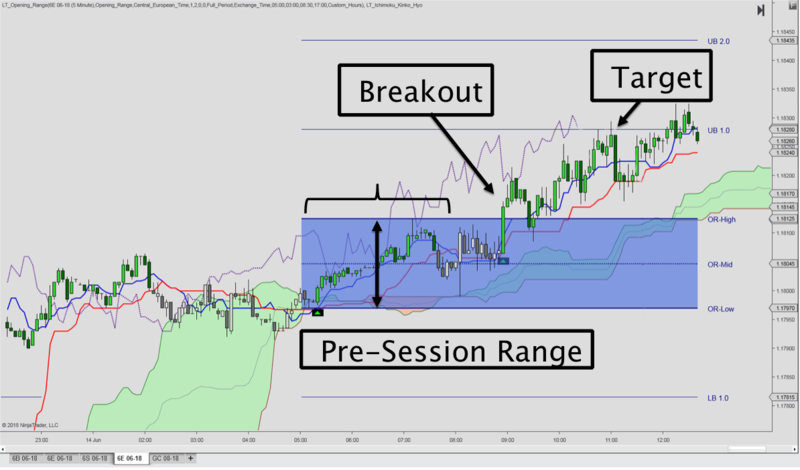 The London Breakout is a well known Forex strategy centered around the London open. However, since the UK voted for leaving the EU, there looks to be more activity around the Frankfurt open which occurs one hour earlier. in any event, the basic idea is to use the Ichimoku to qualify breakouts signals at the opening of the European session. The breakout levels are found by looking at the high and low points set during the final hours of the Asian session, leading into the EU-Pre Session. This is a 3 hour time window from 5:00 to 8:00 CET when the markets open in Frankfurt. During this time period, the Multi Timeframe Opening Range indicator is used to define the High and Low areas of the range, whereas the Ichimoku is used to confirm whether the signal is accompanied by the trend and appropriate momentum. Furthermore, once a position is entered, the Opening Range is used to determine the Stop Loss and Profit Target levels. Finally, we look to align the breakouts signals with the broad and intermediate bias. This is done by looking at the Monthly and Weekly Range Weighted Average Price (RWAP). Of course, the better know “cousin” of the RWAP is the Volume Weighted Average Price (VWAP), which is an important price benchmark that reveals institutional participation and dynamic support / resistance levels. However, Forex instruments are not traded at a centrally located exchanges and therefore, volume data is unlikely to correctly represent the underlying market. Accordingly, using VWAPs with Forex instruments should therefore be carefully considered. Because volatility is roughly proportional to the square root of volume, a volume-weighted average can be mirrored by using the squared ranges as the weighting factor. 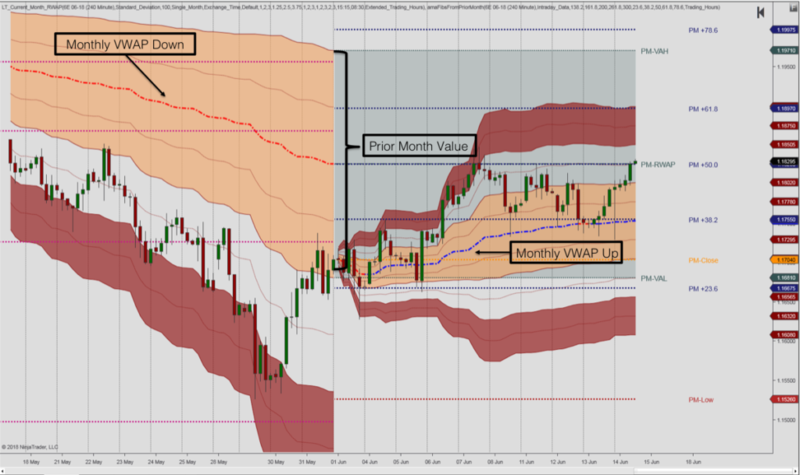 Specifically, the Monthly VWAP / RWAP and the Weekly VWAP / RWAP can be used to see whether we’re in a broad/intermediate uptrend, or whether we’re in a sideways market. To learn more about the professional version of the Ichimoku, Opening Range and Session VWAP Package, visit our premium section now.